Salam Friends! Today we share most popular media player VLC v2.1.17 Beta Apk for Android Device, the new application is faster and has more features! For more Amazing Apps You can also get us on Facebook, Twitter and Subscribe to our RSS feed. 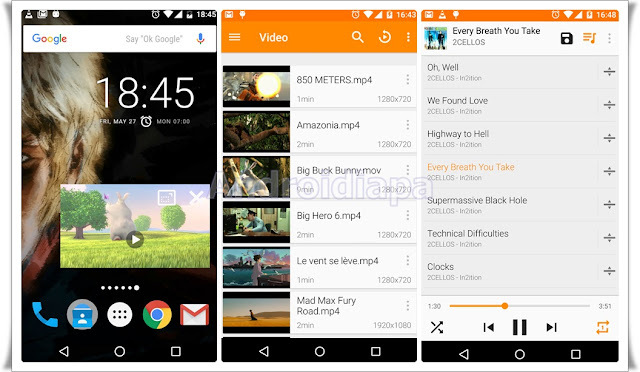 Here you get latest Beta version of VLC media player v2.1.17 Apk for android. This is the port of VLC Media Player to the Android platform. VLC for Android can play any video and audio files, as well as network streams, network shares and drives, and DVD ISOs, like the desktop version of VLC. VLC for Android is a full audio player, with a complete database, an equalizer and filters, playing all weird audio formats. See the guide below to properly install VLC media player on your android device.